On the Road with Professional Technology. Sturdy racing frame of reinforced tubing galvanized inside and out for high corrosion resistance. Shoe Brake resistance system with continuous adjustment. Combi-click pedals (platform and clipless) weighted for platform side of pedal to rest upright. Vertically and horizontally adjustable racing saddle, padded with high density foam. 40 pound flywheel, balanced and chrome plated. Vertically adjustable handlebars with hygienic rubber coating. Industrial strength, sealed bearings in bottom bracket with THUN® pedal arms. Floor levelers in rear for stabilization on uneven floors. Casters in front for easy transport. MAX user weight 285 pounds. 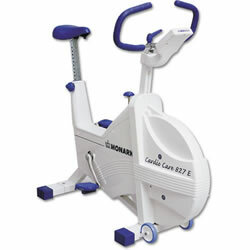 Professional exercise bike designed for intensive use in institutions and gymnasiums. Improved electronic meter includes speed, distance, heart rate, pedal RPM, and time (count up/down). Sleek look with protective flywheel cover and easy assembly. Safe pinlocking seat. Easy transport wheels come complete with this unit. 1 year guarantee. 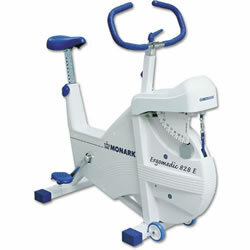 The Monark pendulum balance ergometer is the world’s most used test cycle for fitness testing. 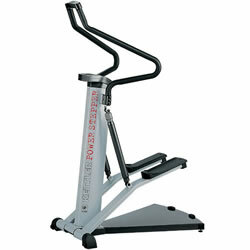 The only approved test cycle for the U.S. Air Force and Federal Fire Departments.Features Include:• Fully adjustable seat • Easy to calibrate pendulum balance. Set work load resistance in Newtons or kilopounds. 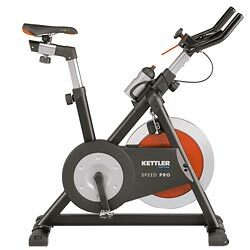 Brake power in watts at 50 and 60 RPM• Protective flywheel cover• Wheels for easy transportation• Electronic meter that shows RPM, heart rate, time, speed, distance, calorie consumption, and power in watts• Polar compatible heart rate monitoring• Heavy duty frame• 1 year guarantee. 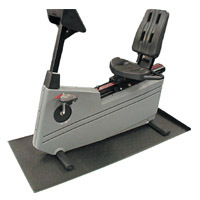 • Pebbled top surface adds non-slip traction for user and equipment.